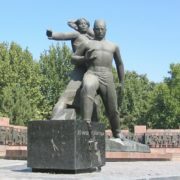 The Tashkent residents were awakened by the roar emanating from the ground. The city was shaken by the tremors of destructive power, and the sky was burning with a pink glow that resembled the diffused lightning. Before the eyes of the frightened people, the unbridled elements crushed the walls of their homes. That forced them to leave their homes in a hurry and then to live in tents for several days. In addition, then were recorded more than a thousand tremors. Citizens who lived in the seismically active zone got used to a periodic “shaking”, however, this time were thrilled in earnest. An earthquake measuring 8.3 on the Richter scale turned most of Tashkent into ruins. Its epicenter was just in the central districts of the city. Thus, the earthquake destroyed over two million square meters of living space. In particular, 236 administrative buildings, 700 objects of trade and public catering, 26 communal enterprises, 181 schools, 8,000 school places, and 36 cultural institutions. Besides, 78,000 families lost their shelter. But the city survived. Steadily and amicably people experienced an unexpected grief. Supporting each other, helping those who were harder than others, they did not become embittered, and did not panic. During that period of time, while the storm was raging, there was not a single case of looting in the city. 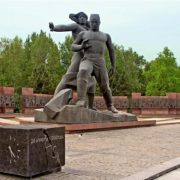 To help in the reconstruction of the city, builders and laborers from all the republics of the former Soviet Union came together. They arrived by whole trains, carrying with them equipment and building materials. As a result, three years later Tashkent changed. Entire inhabited areas have grown on the outskirts of the capital, newly demolished buildings in the center of the city were rebuilt. Ten years later, in 1976, on the site of the epicenter of the earthquake, appeared the Monument “Courage”, symbolizing the fortitude of the spirit and the courage of people facing the elements. 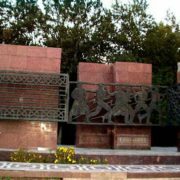 The official opening of the “Courage” memorial in Tashkent took place on May 20, 1970. The author of the monument sculptor Dmitry (Daniil) Borisovich Ryabichev. The artistic image of the monument enclosed in the cube of black granite. 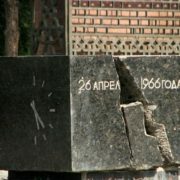 On one side, the engraved date of the earthquake: April 26, 1966. 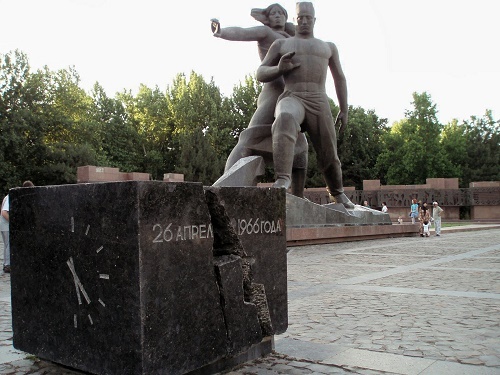 On the other side, the dial of the clock with arrows indicating the time of the tragedy – 24 minutes past 5 a.m. 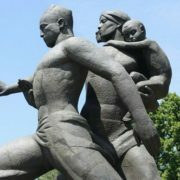 The crack in the form of a zigzag, symbolically denotes the split of the earth’s solid, divides the cube into two parts and goes to the pedestal of a bronze sculpture depicting a family that has witnessed a natural disaster. A woman clinging to her child, with the other hand protects the baby from trouble. And a man protects both of them. To the marble pedestal there are 7 paths leading to 14 stele with bas-reliefs depicting the work of the builders. 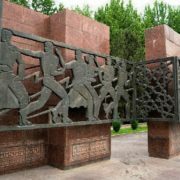 The whole country restored Tashkent and the stories depicted on the steles tell of the assistance rendered to Tashkent by the fraternal republics of the former Soviet Union. 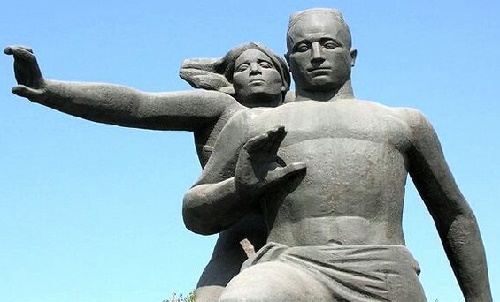 Meanwhile, the author of this work sculptor Ryabichev arrived in Tashkent almost immediately after the tragic events and together with the architects L. Adamov and S. Adylov began to lead the creative team of the creators of the memorial.